Thomas. P. O’Neill, President & CEO The healthcare system tests routinely for conditions such as cervical cancer, diabetes, cholesterol, colon cancer, etc, but there is no consistent standard of care around cognitive health testing. Cognitive testing is often performed too late when cognitive functions are moderate or severely impaired. In addition, current cognitive testing consists of simple decades-old tests performed either with paper and pencil or embedded in a computer. Cognitive impairment is not a normal part of aging. As we know, cognitive issues are the hallmark of Dementias, eg. Alzheimer’s Disease, Lewy Body’s, Vascular and others. Alzheimer’s disease is a significant, growing issue for the entire healthcare system and directly affects patients, caregivers, providers and payers. Over 5.7 million people are living with Alzheimer’s Disease and the number is expected to triple by 2050. While there is no cure, early diagnosis and proper disease management are key to patient’s overall health and quality of life. Studies show that a healthy diet, exercise, occupational therapy and other lifestyle changes involving patients and caregivers may potentially delay disease progression. The earlier the testing, the earlier the patient is diagnosed and managed appropriately. It is important to note that cognitive impairment may also occur as a result of a variety of treatable underlying conditions such as type-2 diabetes and other cardio vascular and metabolic issues, sleep disorders, depression, chronic pain, post-concussion, post-stroke, multiple sclerosis, epilepsy, Parkinson’s disease, ADHD, autism, among others. Also, is known to be a result of long-term poor life style choices such as substance abuse, sedentarism and unhealthy diets. Again, the earlier the patient is tested, the early the physician may intervene. This is where Cognivue brings tremendous value. It is a state-of-the art cognitive risk assessment test that objectively, quantitatively, and reliably identifies changes in cognitive function when intervention and management can make a difference. Better management and planning fosters better patient outcomes and lower patient costs: less complications, unanticipated visits and expenses. Cognivue is the first FDA cleared computerized cognitive test for patients aged 55 - 95 years old. It is based on adaptive psychophysics technology and years of research focusing on early detection of late-life cognitive decline (LLCD) and dementia. The technology is devised in a way that uniquely calibrates each individual’s motor and visual abilities and continuously adapts to the patient’s performance providing a customized test specifically for each patient. The current, most used, cognitive tests are performed and scored by a healthcare professional, and whether in the original paper and pencil form or embedded on an iPad or computer, brings several issues related to human error, subjectivity and confounding factors including environment and cheating. Cognivue’s technology changes this landscape with a rapid and objective ten minutes test, eliminating subjectivity and environmental confounders. Also, Cognivue’s test cannot be learned after repeated sessions or after an internet search. 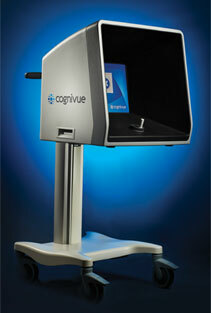 Cognivue testing fits any doctor’s office workflow, producing simple and easy-to-interpret reports. The unit offers a self-administered test with a cover that fosters patient’s attention and instructions that make it easy to operate. Cognivue is an assessment aid to test cognitive functions and it should be interpreted by qualified medical professionals. Cognivue promotes consistency as each device is uniformly calibrated so the clinician can compare scores regardless of the location the patient took the test in, eliminating human subjectivity/inaccuracy. “Anyone who knows Tom Golisano, knows his business prowess and his significant philanthropic work, and knows this is a great fit and opportunity,” states O’Neill. Cognivue offers a computer testing device and method that can be administered in a physician’s office. Placed on a desk or a mobile cart, the self-administered test focuses on key cognitive domains: the motor and visual function perceptual processing, memory testing and executive functions. The test unit includes the CogniWheel®, the CogniCover®, and CogniSystem®. While the CogniWheel® minimizes all variances in patient response performance, resulting in better outcomes, the CogniCover® limits distractions, promoting patient’s attention and focus through the test. The CogniSystem® is an algorithm that automatically calculates an average risk score that is easy to interpret and understand. The panel of ten tests takes about ten minutes to complete, resulting in a one-page report with a single numerical risk score. Using this score, the physician determines the patient’s risk stratification and decides on an appropriate course of management. Cognivue has been adopted by primary care family practices but also by neurologists, psychiatrists, geriatricians, pain and sleep specialists. They have been using Cognivue as part of the overall patient work up and before making treatment decisions. “This screening tool promotes early detection of cognitive impairment and other underlying conditions that would have gone underdiagnosed and untreated before. It fosters the patient-physician dialog when it matters!” says Dr. Reina Benabou, SVP and Chief Medical Officer, Cognivue. “We have been approached by numerous clinicians who have shown keen interest and taken on our device for the benefit of their patients and practice,” adds O’Neill. Patients and health providers are equally benefited by the cognitive risk score. A routine test determines a patient’s risk level and further helps improve and treat any symptoms related to memory, language, thinking, and judgment. The risk assessment score allows clinicians to identify a patient’s risk at a much earlier stage. The risk assessment score allows the clinician to mitigate risk by implementing protocols and strategies for better care. Besides, the score helps clinicians to understand a patient’s cognitive health better: it eliminates uncertainty about a patient’s cognitive status, provides new valuable patient service, and attracts new patients to practices: everyone should be in charge of their cognitive health. To illustrate the success of the Cognivue device, O’Neill gives an example of a patient with a cognitive impairment, sleep apnea, whose risk assessment score was an average. Early detection led to the patient being prescribed CPAP. A retest after six months showed a significant increase in his scores and the patient is much more productive. Another patient scored low on Cognivue. Doctors ordered blood work, administered the depression scale, and found that the patient had a history of untreated depression. The doctor prescribed the anti-depressants and monitored cognition over time with Cognivue. The scores improved each time and the patient feels much better. "Cognivue, a risk assessment test objectively, quantitatively, and reliably identifies changes in the cognitive function"
To keep up with the changing times, Cognivue is investing in clinical studies/data, next-gen device development, label expansions, customer support, and field sales expansion over the next 12-18 months. Also, the company is looking to make significant improvements in the functionality of the device, the software and the algorithm behind it, making Cognivue a one-stop-shop for all cognitive testing. The company will also help train staff, as well as help doctors and nurses to adopt the technology. “There are a lot of healthcare providers and doctors who understand the benefit of Cognivue. They can utilize this test to do what they do best—identify the problem, find a solution, and ultimately, elevate the standard of care for cognitive testing,” concludes O’Neill.